مدیری, مهدی. (1390). اشاره:ارزشیابى روش هاى پشتیبانى از تصمیم گیرى فضایى گسترش سامانه هاى اطلاعات جغرافیایى (قسمت دوّم). 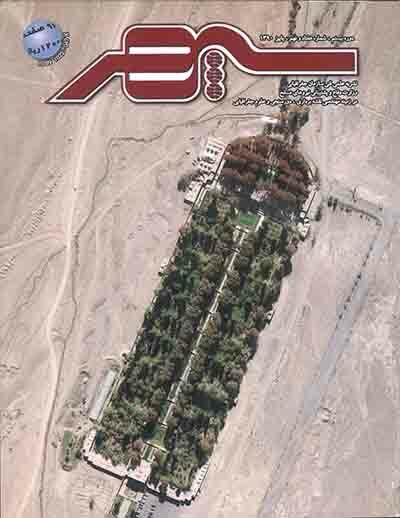 فصلنامه علمی- پژوهشی اطلاعات جغرافیایی « سپهر», 20(79), 2-8. مهدی مدیری. "اشاره:ارزشیابى روش هاى پشتیبانى از تصمیم گیرى فضایى گسترش سامانه هاى اطلاعات جغرافیایى (قسمت دوّم)". فصلنامه علمی- پژوهشی اطلاعات جغرافیایی « سپهر», 20, 79, 1390, 2-8. مدیری, مهدی. (1390). 'اشاره:ارزشیابى روش هاى پشتیبانى از تصمیم گیرى فضایى گسترش سامانه هاى اطلاعات جغرافیایى (قسمت دوّم)', فصلنامه علمی- پژوهشی اطلاعات جغرافیایی « سپهر», 20(79), pp. 2-8. مدیری, مهدی. اشاره:ارزشیابى روش هاى پشتیبانى از تصمیم گیرى فضایى گسترش سامانه هاى اطلاعات جغرافیایى (قسمت دوّم). فصلنامه علمی- پژوهشی اطلاعات جغرافیایی « سپهر», 1390; 20(79): 2-8. تصمیم گیرى، مهمترین چالش مقابل کارشناسان و متخصصان در حل مسائل حوزه هاى گسترده برنامه ریزى شهرى و منطقه اى است. مسائل تصمیم گیرى چند معیاره، معمولاً شامل مجموعه اى از موقعیت هاى مکانى است که باید براساس چندین معیار مختلف ارزیابى شوند. رویکرد گروهى، تصمیم گیرى را به عنوان یک فرآیند تکاملى مى نگرد که با استفاده از بحث، استدلال و اجماع نظر از یک گفت و گوى به شرح پرسش مى پردازد. منطق بررسى این است که در یک محیط پشتیبانى تصمیم گیرى گروهى انجام گیرد و به منظور پشتیبانى مؤثر مشارکت گروهى در تصمیم گیرى، ابزار تحلیل و همکارى بایستى با هم تلفیق و یکپارچه شود. در ارتباط با اهمیت و نقش تصمیم گیرى، روش ها و شیوه هاى مختلفى تاکنون براى پشتیبانى از تصمیم گیرى مطرح و همواره کارآیى و اثر بخشی آنها مورد توجه مى باشد. پردازش ها و تجزیه و تحلیل هاى تصمیم گیرى چند معیاره در GIS را مى توان به منزله فرآیندى که داده هاى مکانى و مقادیر ارزیابى ها را با هم ترکیب کند، در نظر گرفت. Evaluation of methods of support for spatial decision of the development of geographic information systems (Part II). Decision-making is the most important challenge facing experts and specialists in solving the problems of broad urban and regional planning. Multi-criteria decision-making issues usually include a set of location situations that should be evaluated based on several different criteria. Group approach considers decision making as an evolutionary process, which uses discussion, argumentation, and consensus of a discussion to describe question. The logic of the survey is to conduct a collective decision in an environment. In order to effectively support group participation in decision making, the tools of analysis and collaboration should be integrated and consistent. In connection with the importance and role of decision making, various methods have been introduced to support decision making and their efficiency and effectiveness have always been considered. The processes and analyses of multi-criteria decision making in GIS can be considered as a process that combines location data and evaluation values ​​together. 1- Aerts, J. Van Herwijnen,M.,Janssen,R,& Stewart,T.J(2005) Evaluating Spatial Design Techniques for Solving Land-use Allocation Problems,Journal of Environmental Planning & Management,48(1),121-142. 2- Bhargava,H.K.,Krishnan,R.and Whinston,A.D (1994) On integrating Collaboration and decision analysis techniques,Journal of Organizational COMPUTING,4(3): 297-316. John Wiley & Sons Ltd,UK,:4-31. 4- Faber,B.G.,Wallace,W.W and Miller,R.M.P(1996) Collaborative modeling for environmental decision making, Proceedings.GIS.96 Symposium, Vancouver,BC,March.CD-Rom,no pages. 5- Jankowski,P.,Andrienko,G.and Andrienko,N(2001)Map-Centered exploratory approach to multiple criteria Spatial decision making,International Journal of Geographical Information Science,15(2). 6- Jiang,H. and Eastman.J.R (2000) Application of fuzzy measures in multi-Criteria evaluation in GIS,International Journal GIS, 14(2):173-184. 7- Malczewski,J. (2008) GIS-based multicriteria decision analysis: a Critical Overview. Progr. making: a Three-step Procedure, Policy Sciences,26:189-214. 9- Stewart, T.J.,Janssen,R.,& van Herwijnen,M(2004) A Genetic Algorithm Approach to Multiobjective Land Use Planning, Computers & Operations Research,31,pp2293-2313. From Seveso to Bhopal and Beyond,Berlin, Springer Verlay:85-349.